I’m not a middle-grade reader. It’s mostly because I’m old as hell, but also because I find myself unable to relate to these stories of youth, I’m so far removed from. I haven’t been a middle grader—since a middle grader has been me. But, Chase told a story that’s relatable for ages 12-92, even me. Tai and Mila aka Bean are best friends. At least they were before Mila went to visit her Aunt over the summer—returning quietly, wanting to shed her childish nickname—and the stigma that surrounds her neighborhood, and any drama that comes along with it. She’s Jamila, more than the Cove, more than a girl from the improvised neighborhood of the Cove, just more. But it’s the secret that she keeps that really drove and continues to drive her away. Between her feelings of wanting out, and her beef with her best friend, Tai. This could have easily been switched with adult characters and been just as relatable. The lingo and voices keep this story young, and current—but it will also appeal to adults with its underlying message of, it's okay to have a dream. It’s okay to want out, to not want to be friends with someone anymore, it’s okay to just be you. Although I find we teach this message to the younger people, its definitely something that can extend to the older generation, myself included. We have to learn to not be so hard on ourselves sometimes—and this book is a reminder of that. That you can mess up, and still redeem yourself. The book is slow moving, and filled with juvenile drama—but it’s one of those reads—that do something for the people reading it. It’s culturally correct without being stereotypical. 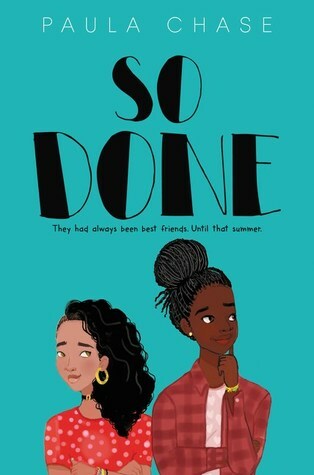 It’s solid and down to earth, So Done is the kind of book you’ll want to hand to both your older and younger siblings. Chase did a positive and eye-opening thing for our youngsters, and I think she got it right.